Muscle it., originally uploaded by [Zakkaliciousness]. Up the hill she went. In a hurry, it appeared. Wearing winter boots that are rather trendy amongst the studying classes this year. 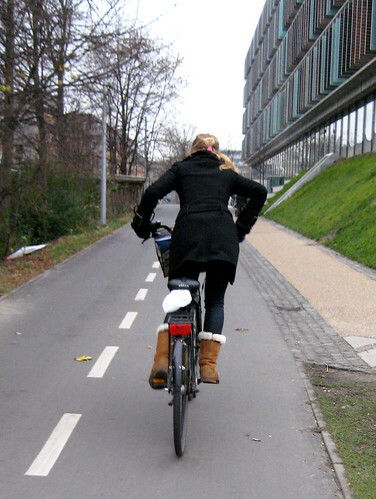 She's cycling on a "Green Bike Lane" - one that weaves its merry way across the city. It's not as practical as the ordinary 330 km of bike lanes in the Copenhagen that place the bikes as equal traffic vehicles alongside the cars and trucks, but it's good for some. Over at Cycleliciousness - the Copenhagen Bike Culture Blog - we've tried to debunk a couple myths. One is that the Romulus and Remus of bike culture - Copenhagen and Amsterdam - are the only cities that ride. A lot. We highlight other cities with bike culture on the agenda. In addition, we got tired of hearing that old chestnut: "Danes and Dutch only ride so much because they live in flat countries..." So we provide some stats about how other more topographcially thrilling cities have a thriving bike culture. Have a look if you have the time. "if I could only get away from this freak with the camera!"